Selecione até 13 pessoas no total. Maximize o seu tempo limitado em Roma e contorne a fila de ingressos aparentemente interminável no Coliseu. O bilhete especial concede-lhe acesso exclusivo ao piso da arena onde ficavam os gladiadores. Ouça enquanto seu guia vai além do que você obtém em um guia de áudio típico. Ouça a história de bastidores de lutadores, espectadores e muito mais. Depois, use o tempo que você economizou para explorar outras atrações, desfrutar de comida italiana ou simplesmente relaxar. Esta excursão explora tanto a arena quanto o 2º nível em apenas 1 hora. Be aware that this tour does not start at the posted time. You have up to 25 minutes to be LATE! As such some very inconsiderate members of our group were about 1/2 an hour late. When they arrived, we then started our tour. I booked a 60 minute tour because of the time in my schedule for that day. I did not anticipate that the 60 minute tour would start 30 minutes later or I would have booked the tour 1 hour before. Then the tour continued past the 1 hour start time. (I booked the noon tour that started at 12:30 because they waited on the last 2 people to show. Then the tour 60 minutes started at 12:30. I had to leave at 1:00 - the time I was expecting for the tour to end to meet my next engagement.) So thanks to the late start, i.e. by the tour company and the late groupies I did not get the full advantage of the tour but those that arrived late did. I would never book this tour unless you have no other engagements. Also, you get 10 min on the arena floor and 10 to the side of the arena. The rest is narrated by the tour guide. Really amazing tour, could not fault it. 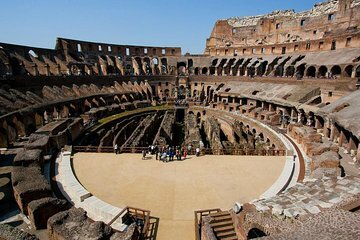 The tour itself was really special, getting to enter through the Gladiator's Entrance and experience the Colosseum from the unique perspective of the arena floor was incredible. Our guide was wonderful, she was a native English speaker and was full of knowledge and fun. The Colosseum itself was extremely busy, we spoke to people who had stood in line for over an hour just to get tickets so the fact that we were able to skip the queue with this tour and have special quick access was a great bonus. You won't be disappointed if you take this tour.